It is important to understand what this database is. 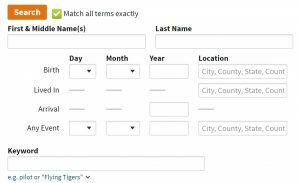 It is an index of various indexes to naturalization records. It is not an index to the actual records themselves. 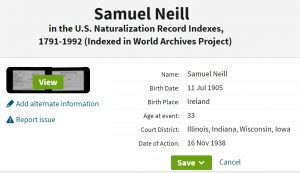 The index entry for Samuel Neill links to a digital image of an index card for Samuel that has microfilmed by the National Archives as a part of the “Soundex Index to Naturalization Petitions for the United States District and Circuit Courts, Northern District of Illinois and Immigration and Naturalization Service District 9, 1840-1950,” and originally published as National Archives microfilm publication M1285. This index includes records outside of Illinois, including the court in Hammond, Indiana, where Samuel naturalized and is described in the NARA pamphlet written about NARA microfilm publication M1285. Samuel’s index card only contains key elements of his naturalization–enough to find him in the actual records and distinguish him for other individuals of the same name. After all, that’s the purpose of the index. These cards were originally sorted by the Soundex code associated with the last name (that’s the N400 in the upper left hand corner) and then further sorted alphabetically by the first name of the individual. The cards are in order on the film, just not in strict alphabetical order based upon the last name. I wanted to find the index entries in Ancestry.com‘s database for other members of Samuel’s family (particularly his father and his siblings) who also likely naturalized in the same place as he did. Ancestry.com‘s “U.S. Naturalization Record Indexes, 1791-1992 (Indexed in World Archives Project)” does not include the specific court for individuals in this database whose index card images were taken from the NARA publication M1285. The database entry for the court of naturalization of these individuals is “Illinois, Indiana, Wisconsin, Iowa” as shown in Samuel’s entry from the Ancestry.com index. I wanted to restrict my search of Ancestry.com‘s database to other entries from publication M1285 as I didn’t need to search all the geographic locations included in the database. 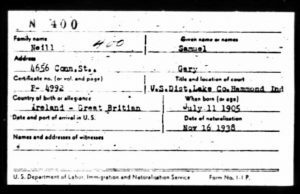 The problem was that the Ancestry.com database did not include any of the specific location information of Samuel’s naturalization in his entry and it likely would not for any of the others whose names were included in the Ancestry.com index from the M1285 index cards. My workaround was to place “Illinois, Indiana, Wisconsin, Iowa” in the keyword box of the search interface (including the quotes). This approach worked and allowed me only to search the same microfilm index from which Samuel’s card was taken. Entries were located using this approach for Samuel’s father and siblings. Had this approach not worked, I could have searched the digital images of M1285 manually–as they are sorted on the microfilm (first by Soundex code for the last name and then by first name for all individuals whose last name have the same Soundex code). Had that not worked, I could have searched the actual records manually. That was my last resort and was not necessary as my initial approach worked. Here it is clear that the researcher needs to know what they are searching and how it is organized. Sometimes that’s easy to determine and other times it is not. That process is often easier if one has researched the records in the “pre-digital” era. In an upcoming post, we will take a look at the actual naturalizations for Samuel and his family. They were a great find.